← Couldn’t Make The Arrow Reunion? In 1960, Martha Aasen was living in California. The Democratic National Convention was held in Los Angeles. Martha came from a family of avid Democrats. Her father was a convention delegate from their native Mississippi. Her brother wangled a job as a driver for Stuart Symington, one of several men still jostling for the nomination. Kennedy’s visit paid off. On the night of the roll call, Wyoming’s 15 votes gave him the nomination over his closest rival, Texas senator Lyndon B. Johnson. Though longtime Westporters Martha and Larry Aasen have been active in Democratic politics — and attending conventions — ever since, 1960 was not their first. Four years earlier, one of Larry’s North Dakota Republican friends got them into the Republican convention at San Francisco’s Cow Palace. They watched as President Eisenhower and Vice President Nixon were renominated. 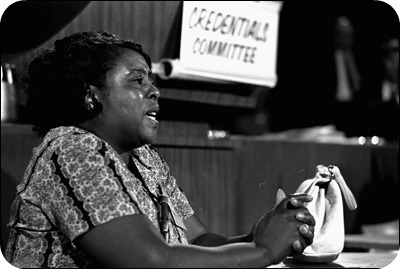 Fannie Lou Hamer faces the Democratic credentials committee. In 1964 the Aasens were in Atlantic City. Martha’s mother was a Mississippi delegate. That year, the biracial Freedom Democratic Party challenged the seating of the state’s all-white delegation. Fannie Lou Hamer gave a rousing speech. The governor urged his white delegation to walk out. Most did. Martha’s mother was one of the 3 or 4 who did not. Forty years later, in 2004, Martha was a delegate at the Boston convention. Connecticut was seated next to Mississippi. Thousands of delegates — of all races — paid tribute to the work of Fannie Lou Hamer, and other brave people who fought for civil rights. The Boston convention also featured an electrifying keynote speech by Illinois legislator Barack Obama. “Everyone there knew we were hearing someone special,” Martha recalls. Martha was in Denver 4 years ago, when Obama was nominated for president. She’d been back in Los Angeles in 2000, too. That was one of the few times Connecticut had good seats. They were seated right in front, next to Tennessee. The reason, of course: Al Gore’s running made was Joe Lieberman. Martha missed the 1968 Chicago convention — perhaps the most famous of all — as well as the others before 2000. She was working for the United Nations, and could not be actively involved in domestic politics. Now 82, she looks forward to the upcoming Charlotte convention. The event has changed since the JFK days — more security, less spontaneity, and the nominee is known in advance — but they’re still exciting. And who knows? Some day, once again, a candidate may come calling on Connecticut. Just as John F. Kennedy did with Wyoming back when he needed a few more votes, wherever they were. This entry was posted in Looking back, People, Politics and tagged Barack Obama, Democratic National Convention, John F. Kennedy, Larry Aasen, Martha Aasen. Bookmark the permalink. Martha Aasen is a great model for civic engagement and I have tremendous admiration for her. She has worked hard and tirelessly for Westport, for Connecticut, for her country, and at the U.N., for the betterment of the whole world. And she is not done! I don’t really know Martha (we travel in different political circles) but I surely know my Minny Bus (ca 1971-79) buddy Larry, a nicer man would be hard to find. 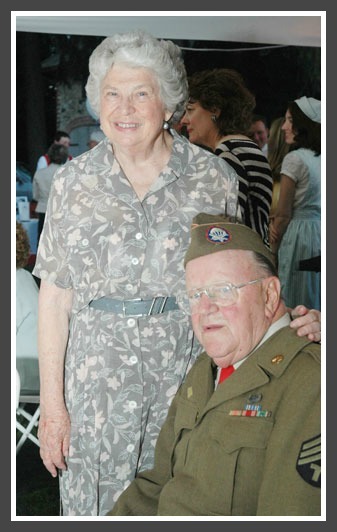 And Larry was in the WWII Airborne Glider Infantry [see his uniform] and we met at Bedford on Veterans Day. Quite an interesting tale he told of sitting for hours in a glider waiting to be towed into the air and released over enemy territory…NOT for the faint of heart.